Energy, creativity, joy, and wisdom are all attributes associated with the colour turquoise, and these are the qualities our Mood Colour Therapy Turquoise Candle can help to bring to your home. Bright, fresh and calming, turquoise has inspired this charming luxury fragrance candle, scented with mangrove wood, hyacinth and coral flowers. Presented in an elegant turquoise glass votive, this beautiful candle will transform your home with a vibrant palette of inspiring scents – helping to lift your mood and brighten your living space. To replicate the soothing and creative colour of turquoise, our skilled perfumers have blended a collection of scents extracts that inspire serenity, emotional balance and energy. Mid notes of light coral flower, extracted from the plant’s recognisable soft peach petals, mingle with the strong floral bouquet of hyacinth, while the warm, creamy scent of mangrove wood balances and refines the fragrance. This trio of unique scents come together to infuse your home with a fresh and invigorating fragrance inspired by the vivacious hues of turquoise. 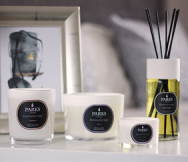 Each candle is hand-poured using 100% natural wax, to produce pure and long-lasting fragrance. And, like all Parks luxury scented candles, this woody turquoise votive features our signature clean burn and soot-free wick technology, for a truer scent and minimal leftover wax residue. Whether bought as a gift or as a fragrant treat just for you, this luxury candle, inspired by the timeless colour turquoise and supplied in a luxury gift box, promises to be an elegant and inviting addition to any home.